Kaiserslautern’s Bryan Lunn gets his shot rejected by Ramstein’s Temi Alumanah. Naser Eaves and Jason Jones Jr. combined for 39 points as Ramstein defeated crosstown rival Kaiserslautern 65-49 Tuesday to remain undefeated in boys basketball. On the other side of the autobahn, Kaiserslautern outlasted Ramstein 37-33 to stay unbeaten in girls league play. Kaiserslautern’s boys had the unenviable task of playing at Ramstein without their two top scorers, Tre Dotson (toe) and Ervin Johnson (shoulder). But with grit and a well-played game plan, the Raiders only trailed by three after three quarters. 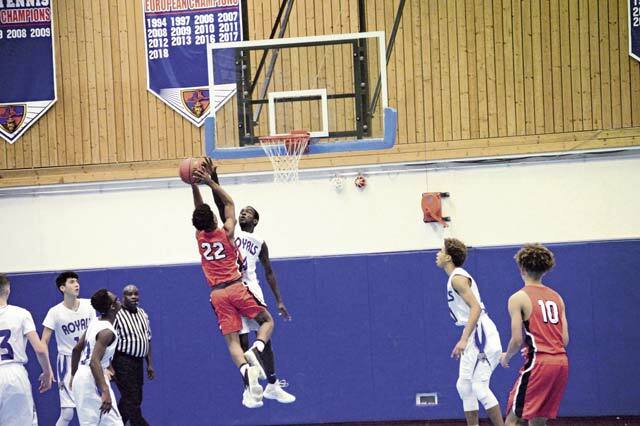 It was as though Ramstein had gone into hibernation as Brandon Morris had ten first half points and Eric Santiago seven and the Raiders battled for rebounds with the taller Royals. Trailing 42-39 and knowing that Ramstein senior Jake Fraley and junior point guard JJ Little had four fouls, the Raiders started the fourth quarter with a steal and momentum. But, someone poked the bear and the hibernation was over. As is their trademark, the Royals took it out of cruise mode and went on a wild run with Jones scoring on a coast-to-coast layup, freshman Elisha Williams nailing two jumpers and Eaves drilling a three from the corner. Kaiserslautern Coach Corey Sullivan called a time out and the game was locked up. The Raiders Kendryk Jenkins hit a three, but it was all Royals down the stretch with Jones putting the dot on the exclamation point with a two-handed slam dunk. Ramstein outscored Kaiserslautern 42-23 in the second half. In Kaiserslautern, the outcome of the back and forth girls game was a mystery until the last few minutes. Ramstein managed to hold high-scoring senior Le’Jhanique Brown to five points. But two of them were clutch free throws in the hectic fourth quarter to pace the 37-33 Raiders win. Both teams had opportunities to win it at the free throw line, but both were just three of nine in the fourth. Kaiserslautern led it by two after three quarters. The Royals tied it at 26 with 6:45 remaining and went ahead on a free throw. After trading the lead, Ramstein went back up by a point with 3:22 remaining on two free throws by Adelina Bonilla. But the Raiders tied it on a made free throw and iced it on a layup by sophomore Aryana Johnson with less than two minutes remaining. Ramstein’s Shemilia Johnson led all scorers with ten points. The Royals defense held Kaiserslautern’s outstanding point guard Emanjae Hawkins to six points, but her defense and all around play helped set the tone. 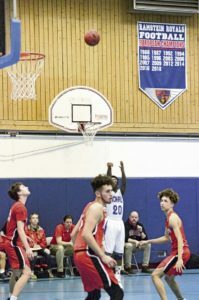 On Friday and Saturday, Ramstein’s boys continued their undefeated season with two home victories over scrappy Vilseck while the girls used their stifling defense to do the same. The Royals boys defeated Vilseck 75-50 and 68-63. The Royals girls defeated Vilseck 47-16 and 38-18. Ramstein’s boys got the usual leadership from Eaves, Fraley and Little. Eaves dominated Saturday’s game in the third quarter with a three pointer and three straight drives to the basket, one a thunderous slam. He finished with 19 points, 11 in the third period alone. Fraley canned a key three pointer to halt a Vilseck run. He ended up with 11 points. Little started with three 3 pointers and ran the offense efficiently, finishing the game with 14 and double digits in assists. But it was the contribution of freshman Williams and Jones Jr. that got the Royals over the hump in their close victory Saturday. Williams was in the ballgame to check Vilseck’s lightning -quick point guard Xavier Bynes and snaked through the lane for a crucial lay up to stem Vilseck’s momentum. Jones Jr. grabbed a key rebound and basket late in the game to seal it. For Jones, the last quarter was a make up for what he considered a less than stellar performance the day before, when he missed all five free throws and only scored four points while battling to keep massive Vilseck center Jonas Matthews off the glass. “I went home after the game last (Friday) night and thought about it,” he said with a smile on his face after the Saturday contest. “But I realized you need a short memory in this game. I was glad I was able to help out today. I enjoyed playing against Matthews. He is such a big guy and works very hard.” Jones Jr. ended Saturday with 14 points and several clutch rebounds. Coach O’Connor agreed that Friday was not Jones’ performance. But his faith in Jones never wavered. “Jones Jr. really struggled on Friday night, so to see him come back on Saturday with a big game and clinching basket was good to see. He is a high-character player and we can always count on him to give maximum effort,” he said. Eaves led the team with 19 points, 11 in the crucial third period. Little had 14 with several assists while Fraley added 11. Jones had 14, including five timely fourth quarter points. Bynes had 19 for Vilseck with three 3 pointers, frequent trips down the lane and numerous clutch passes for baskets. Matthews had 11 and dominated on the boards. Cameron Gaetos had 13 points and played well for Vilseck when Bynes took a breather on the bench. The Ramstein girls won both of their contests. On Friday, the Royals did anything they wanted and blew out Vilseck 47-16. On Saturday, Vilseck recouped from their lackluster performance of Friday night and gave the Royals a battle before falling 32-21. The Royals started the game enthusiastically, but were ice cold and were down 5-2 at the end of the first quarter. But led by fiery guard Alexis Tri, the Royals defense forced Vilseck into several turnovers and lackluster shooting and got their running game into gear. Vilseck played much calmer and was more focused than on Friday, but Ramstein’s experience, determination and depth wore them down. “Adelina Bonilla, who didn’t do so well scoring on Friday, picked it up on Saturday, even though she only had eight points, she still had eleven rebounds. Very close to a double-double,” Brewster said. Both boys and girls will now have several games in a short time. They both want to continue to build momentum for the all important tournament time in a few weeks. SHAPE travels to Ramstein this weekend and Kaiserslautern is home with two very important league games with Stuttgart.